The FireStorm Professional Audio Player allows you to fire a pyromusical firework show in conjunction with our FireStorm TX2 Control Desk. The music is played in perfect synchronisation with the firework script, allowing a seamless pyromusical experience. Setup is easy and the Audio Player is designed to work flawlessly with the FireStorm TX2 Control Desk. For easy connection of studio quality headphones. Normal 3.5mm headphones can also be used with a supplied adaptor. This output can also be connected to consumer grade powered speakers. True balanced audio outputs for connection to any professional power speaker system or mixer desk. A balanced audio output means long cable runs with no interference. Track name, volume and time-code information are displayed on screen for easy diagnostic and setup. 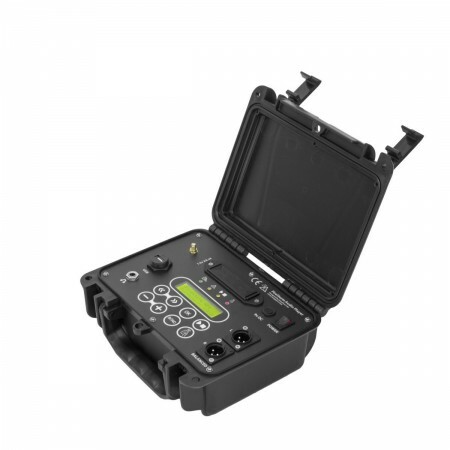 Built into the same rugged case as our RX18 Firing Module and TX2 Scripted Control Desk for real world use. 8 x audio tracks can be stored and played throughout the firework show. 4 x AA batteries or external 9-12V power supply for maximum flexibility and redundancy. The audio will play in synchronisation with the firework show. Start the show and the audio starts. Pause the show and the audio pauses. Skip a section of the show and the audio skips with you. File Format: CBR (Constant Bit Rate) .mp3 files.